Wake me up, I’m dreaming! Friday night, I had a dream that I was running a race in my home town (Creve Coeur) and went off course. By the time I got back on track, the race was almost over, and I was trying to decide what to do about it! Some psychologists have tried to establish the existence of precognitive dreams, in which a dream has a similarity to a future event. I don’t believe in precognition, except to the extent that our brains tend to see patterns of familiarity, after which we retroactively convince ourselves of the precision of the match. Or perhaps we never even had the dream, and the deja vu phenomenon is tricking us into believing we “remember” a past dream of a future event. Of course, our dreams often simply reflect our fears (or concerns, if fear is too strong a word for anything as trivial as a race). Saturday morning, I raced a half marathon in a town I’d never been too, on a course I’d never traveled. You see where this is going…my dream became reality! I ran off course for several minutes (I estimate 5+) and blew my “official” time. I know I didn’t deja vu the dream, because I actually mentioned it to a couple I was chatting with while warming up before the race. It didn’t seem quite so funny after it actually happened! I’m not going to say what race it was, or what town I was in – I am not trying to generate bad publicity for the town, or badmouth the race director, or any of the well-intentioned volunteers that helped put on the event. The race director already acknowledged the issue at the finish line, and apologized to all on the race web site – encouraging suggestions or concerns. Re-mark the course with spray paint on the street in a bold color every year. I saw some markings on the street, but they were in faded white paint – perhaps from a previous year. Especially at key intersections, it would be reassuring to see something like “HALF” or “RACE.” Or, get creative with a stencil. Anything that tells runners that we are looking at something other than some faded utility markings for a gas or water line. Better signage and more of it. It can be better even on a shoestring budget. If you’ve taken the time to place a sign, make sure we know it’s associated with the race. I don’t think I ever got fooled by any garage sale signs, but I did see a few arrows that I was sure didn’t have anything to do with the race, and they looked the same as the race signs. Just add “HALF” or “RACE” to your sign, and we’ll get that warm fuzzy feeling that we’re going the right way. Take just a few minutes with your volunteers to make sure they know the vicinity of course where they will be stationed. At one point close to where I ran off course, there was a lady at an aid station. I could see an intersection not far from where she was standing, so I asked “Which way?” She said, “I don’t know.” I replied, “somebody should!” She agreed. I don’t expect you to have enough volunteers to have somebody standing at every intersection – just that you take advantage of what you do have. I’ll admit that this post is part constructive criticism, part venting. I know it’s not easy to put on a race and have everything come together perfectly. Even big city races with lots of resources get it wrong sometimes – shorting the course, poor directions, unanticipated interference, etc. I also acknowledge that the primary mission of the race I ran was charitable. I didn’t ask for and wouldn’t have wanted a refund of my modest entry fee given that. However, I did travel a significant distance to run the race in part because it was a USTAF certified course. In my mind, that conveys a certain standard of precision and organization beyond a fun run. My expectations were: (1) a clearly marked course; (2) a timed result, accurate for the stated distance; (3) enough competition (hopefully) to keep me motivated and running hard during the race. I was using the race as a benchmark in my marathon training – my plan said “race a half marathon or run a time trial.” I’ve done a 10K time trial solo before, but I didn’t trust myself to run a half, hard, all by myself. My gut told me that I’ve made a return to peak fitness after a summer of hard training. After injury, the winter running layoff and no spring marathon took a toll, but I think I’m back. The race was a shotgun start. There was another guy – older than me, but obviously fit(ter!) who asked me what my goal was. I told him I was hoping for something close to 1:30. He replied that he was shooting for the same. He was the second person (after the aforementioned couple) who mentioned something about the course being not all that well-marked. I joked that I would probably just follow him then. I wish I’d been able to – he finished in under 1:30. We stuck together through the first 4 miles or so, but he was pulling away significantly by the time we reached the part of the course where we passed the start/finish line on our way to the second, longer out-and-back. There was a third guy in the lead pack – younger than me, one of those effortless tall guys who probably ran middle distance and cross-country in college. He was running the relay though, and wasn’t giving max effort as far as I could tell. Unfortunately, I lost sight of the only guy ahead of me not too long before I got off course. That moment when I realized I was definitely off was a frustrating one. Crossing some railroad tracks and running into a T-intersection for a road with no sidewalks or race markings was a big clue. It was very difficult not to shut it down and start walking at that point. However, I resolved to try to get back on course and run angry. I was disappointed in myself for missing any markings that would have kept me on track. Who knows if I did or not! I probably slowed a bit while trying to find my way back to the course, but a few minutes later I saw another runner and latched on. Back on course, I ran hard to the end. At the finish line, a couple of people were on the other side clapping and ready to give me my participation medal. I could tell from the clock that I had run longer than 13.1 based on my pace. 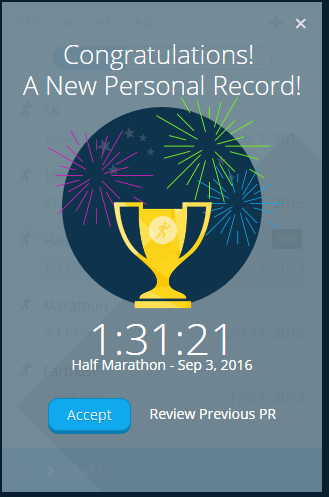 In fact, I’m now sure I ran all of the course, plus some bonus mileage. I stopped short of the mat and took off my timing bracelet, placed it outside the finish line, then walked across the finish. I didn’t want my time to count – I wasn’t sure I ran the course, but I was sure I’d run too far! My watch said 13.92. I was pretty sure I wasn’t going to break 1:30 (a long-standing personal goal) but I probably would have went for it if I had been close and running confidently. However, I ran almost the entire second half of the race knowing it wasn’t going to “count” regardless. I was a little bummed out that I was running in second when I got lost. I’m sure I wouldn’t have caught the first place guy. It REALLY would have been frustrating if I had been leading the race when I got lost! As it turns out, the only other time better than my 1:37 was the aforementioned relay pair. I ended up second for the solo distance anyway. The Kansas City Marathon is just 39 days away! I’m gunning for a PR! You wrote, “My gut told me that I’ve made a return to peak fitness after a summer of hard training.” Well, this is your running buddy telling you the same thing: You are back. 1:31:21 is a nice result, even if it is not USATF certified.